As we celebrate Thanksgiving with friends and family, may we remember why we give thanks—because God is worthy of all our praise and worship. "Sing to the LORD, all the earth! This month marks that yearly tradition where we gather with friends and family around a table laden with food. For most of us, that means turkey and dressing (or stuffing, if you must), cranberry sauce, casseroles, and of course, pumpkin pie. Like the pilgrims before us, we give thanks to God for his rich blessings to us over the past year. The holiday of Thanksgiving is an opportune time to dwell on what God has done and to give him the thanks he is due. The book of Psalms is a rich resource to aid us giving thanks, specifically the psalms of thanksgiving. The book of Psalms was the hymnbook for God’s people. They used it in worship the way we use our hymnals or praise songs today. And just like music today, there were different genres or types of psalms sung at different times, depending on what was happening in the life of God’s people. The psalms of thanksgiving were one such genre and are closely tied to another genre, the psalms of lament. When God’s people needed help and rescue, they sang a lament and cried out to God for help and mercy. These are the darkest of all the Psalms and ones where the psalmist voiced his deepest sorrows, fears, and griefs to God. “How long, O Lord? Will you forget me forever? How long will you hide your face from me? (Psalm 13:1). After God met his people in their need and delivered them, they responded with a song of thanksgiving, thanking God for what he had done. “I will extol you, O Lord, for you have drawn me up and have not let my foes rejoice over me” (Psalm 30:1). To read the rest of this post, visit enCourage. It's the month of Thanksgiving and we all have gratitude on our mind. Some take this month to share on social media what they are thankful for each day. When we take the time to stop and consider, the list of blessings and graces God gives us is unending. We'll spend eternity praising and thanking our Savior for all He has done. In our churches, we have favorite songs and hymns we sing to give God our praise and thanksgiving. Some are more famous than others. Those songs are ones that if we were gathered with a group of Christians from different churches and someone started singing a a well-loved praise song, everyone would chime in together. Think 10,000 Reasons. In the Old Testament, one common refrain sung over and over that everyone knew was, "Give thanks to the LORD, for he is good, for his steadfast love endures forever." This song is found multiple times in the Psalms. It is sung in Chronicles. The returning exiles sang a similar version of it in Ezra. As we make our thanksgiving lists this year, as we go around the dinner table spread with turkey, dressing (or stuffing, if you must), cranberry sauce, Aunt Susie's carrot souffle, and the requisite pumpkin pie, sharing with one another what we are thankful for, let us remember this song. It reminds us that there are two reasons we have to give thanks, no matter the time of year, no matter whether the harvest is plenty or meager, and no matter how hard and painful our trials: God is good and His steadfast love endures forever. In language arts (thanks to my years of homeschooling the kids! ), a predicate adjective is an adjective that follows a linking verb and renames the subject of the sentence. This is what happens when we say, "God is good." 'Good' renames God. It's like saying God and good are the same thing. In essence God equals goodness. Thanking God for His goodness is a reference to His character. We know from reading Scripture that goodness isn't His only trait but it is one that is highlighted throughout the Bible. Everything God made was good (Genesis 1). Jesus told the rich young ruler, "Why do you call me good?” Jesus answered. “No one is good—except God alone" (Mark 10:18). God works all things together for our ultimate good (Romans 8:28). The psalmist clung to God's goodness in the midst of his trials and suffering, "For you, O Lord, are good and forgiving, abounding in steadfast love to all who call upon you" (Psalm 86:5). Everything God does is good. He can't not do good. He works for our good. He does good in us and through us. His goodness is something we can experience and know and feel, "Oh, taste and see that the LORD is good!" (Psalm 34:8). And when we dwell on that goodness, our only response is thanksgiving and praise. The second reason we have to give thanks at all times and in all places and no matter what else is happening is because God's steadfast love endures forever. It's hard to understand steadfast love. The love we often experience from humans is fickle. It is conditional. It comes and goes like the wind. God's love is so pure and perfect; it's incomprehensible. But we see it time and time again in Scripture. God sets His love on His people and never lets go. "It was not because you were more in number than any other people that the LORD set his love on you and chose you, for you were the fewest of all peoples, but it is because the LORD loves you and is keeping the oath that he swore to your fathers, that the LORD has brought you out with a mighty hand and redeemed you from the house of slavery, from the hand of Pharaoh king of Egypt" (Deuteronomy 7:7-8). "And I will betroth you to me forever. I will betroth you to me in righteousness and in justice, in steadfast love and in mercy. I will betroth you to me in faithfulness. And you shall know the LORD" (Hosea 2:19-20). We are wayward but He pursues us. We wander and He always finds us. We are weak and fail Him but He never fails us. In fact, there is nothing we can do to make Him love us less. There is nothing and no one in all creation that can keep Him from loving us, "For I am sure that neither death nor life, nor angels nor rulers, nor things present nor things to come, nor powers, nor height nor depth, nor anything else in all creation, will be able to separate us from the love of God in Christ Jesus our Lord" (Romans 8:38-39). His love is expressed most deeply in the sacrifice of His Son for our sins. "By this we know love, that he laid down his life for us" (1 John 3:16). His love for us began in eternity past and extends into eternity future (Ephesians 1:4-5). It will last longer than the earth and outshine the sun. It cannot and will not end. Two reasons. Two beautiful, glorious, wondrous, and amazing reasons to give thanks this Thanksgiving and every day of the year. God is good and His steadfast love endures forever. It’s the month of Thanksgiving. Walk into any store and you’ll see all things in varying shades of orange, brown, and red. Turkeys, gourds, and colorful leaves decorate every establishment. Our children will dress up as Pilgrims and Native Americans and act out the first Thanksgiving at Plymouth. When we gather around the table on fourth Thursday, we’ll share with loved ones the blessings we’ve received this year and give thanks to God for all He has done. Celebrating God’s goodness and the bounty of His provisions once a year is a wonderful tradition. The Psalms remind us over and over that it is good to give thanks to the Lord. But as believers, we know that giving thanks isn’t a yearly event. Rather, the Bible calls us to give thanks each day and not just for the blessings God has given, but as Paul wrote, “in all things.” “Give thanks in all circumstances; for this is the will of God in Christ Jesus for you” (1 Thessalonians 5:18). “Giving thanks always and for everything to God the Father in the name of our Lord Jesus Christ” (Ephesians 5:20). Indeed, it is easy to offer praise and thanksgiving when the harvest is plenty but what about when there is no harvest? What about when we’ve lost our job, when we’ve lost a loved one, when our dreams have been shattered, when we’ve been rejected and abused, when sin grips us hard, and when we feel lost and all alone?...to read the rest of this post, visit The Christward Collective, my writing home for today. It’s the season of all things brown and orange, of pumpkin spiced confections, and of stuffed turkeys (or turkey with dressing, depending on where you live) . It's the time of year when we gather with friends and family to feast on the season’s harvest and celebrate all that we have been given. Throughout the month of November, our social media feeds will be filled with friend’s lists of things for which they are thankful. And for good reason; there is much to be thankful for: our lives, our health, the food we eat, our families, jobs, and so much more. Giving thanks is a good thing and something we ought to do. 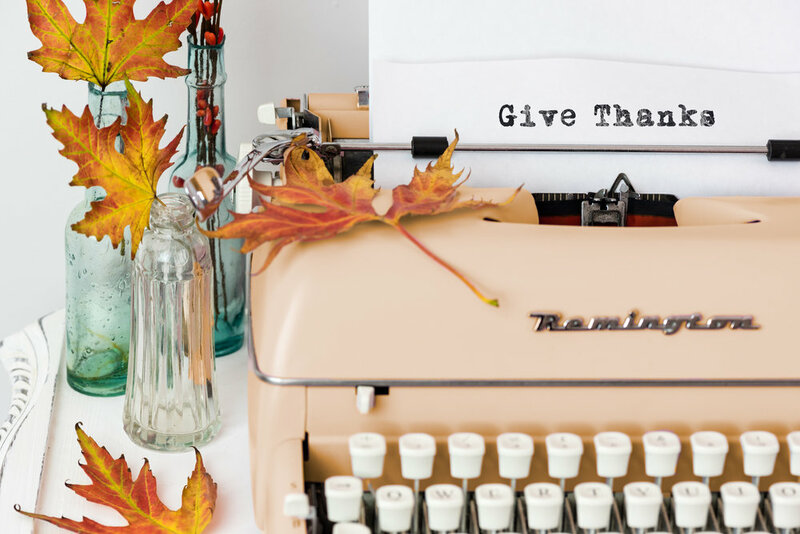 Gratitude and thanksgiving is something that both Christians and non-Christians alike both encourage. Even popular magazines this month will talk about ways to be more thankful. The question is, what makes gratitude different between believers and non-believers? Is there any difference? And can it be more than just a passing fad for the month of November? These are all things I wonder about, this time of year especially. And here is my conclusion: like seeds that fall on poor soil, gratitude won't take root and produce on just any ground. Gratitude and thanksgiving grows and thrives in the soil of humility. In Jesus’ day, the Samaritans were despised by the Jews. It was a hatred that went all the way back to the time when Israel split into two kingdoms and Assyria conquered the northern kingdom. John 4 described this animosity when the woman at the well said to Jesus, "You are a Jew and I am a Samaritan woman. How can you ask me for a drink? (For Jews do not associate with Samaritans)" (4:9). Because of this history, the Jews did not talk to or associate with Samaritans. In the case of the ten lepers, it is not only striking that Jesus healed the Samaritan leper, but also that the leper returned to give Jesus thanks. The Samaritan's gratitude is all the more compelling given the fact that none of the other lepers returned in gratitude. Perhaps he knew more the other nine that he did not deserve Jesus’ healing. He knew well his standing before the Jews and knew that Jesus could have just healed the nine and left him out of it. In humility, the healed leper returned to give Jesus praise and thanksgiving. Jesus responded, “Your faith has made you well.” Not only was he healed and saved on the outside, but his soul found healing and salvation as well. When a non-believer makes a gratitude list, it's not about all the things they are thankful that God has done for them. Rather, it's more like "these are the things I am happy about in my life" kind of list. In thinking about all the good things they have in their life, they feel a boost of happiness. That's because experts say that having a grateful attitude is good for us. Looking at all the blessings we have in our life makes us realize that things aren't as bad as we think. It changes our perspective, reduces stress, and transforms our mood. For many in our society, giving thanks is simply a feel good exercise to greater self-fulfillment and has nothing to do with God at all. For believers in Christ, giving thanks looks very different. It's not about self-fulfillment and it's purpose isn't to make us feel better. There's a different reason for our thanksgiving altogether. Our thanksgiving is directed to someone, to the God who made us. And it is in response to who he is and what he has done. A believer's gratitude comes from a humble heart that acknowledges we are but dust. God created us and breathed in us the breath of life. He sustains us each day. We are completely dependent upon him and can do nothing apart from him (John 15:5). Everything we have is a gift of his grace. As Peter said in Acts, "nor is he served by human hands, as though he needed anything, since he himself gives to all mankind life and breath and everything" (17:25). A humble heart knows its position before the God of the universe and bows in reverence, awe, wonder, and gratitude. Such a heart knows that it is unworthy and undeserving of God’s grace. In reference to this story of the ten lepers, the Gospel Transformation Bible says, “Our worshipful response—or lack thereof—reflects the depth of our understanding of God’s mercy and goodness. The first and greatest response to the gospel of grace is thankful worship.” (p.1387). When we know the holiness of God, the wisdom of God, the power of God, and the rich grace of God, we realize how amazing it is that we are able to stand in his presence and receive his gift of salvation. It is in this fertile soil of humility where thanksgiving grows and thrives. Any other soil that denies God’s holiness, wisdom, power, and sovereignty will only speak words of thanksgiving but without deep roots, it will not thrive or last. Like the nine other lepers, it will gladly take the good gifts God bestows but won't truly honor and thank him for who he is and what he has done. In the soil of humility, thanksgiving grows even in the darkest of nights and in the fiercest climates where suffering and trials bear down hard. This is why Paul could say that we are to give thanks in all circumstances (1 Thess. 5:18). This is where much of the world’s efforts at thanksgiving and gratitude breaks down. It’s easy to give thanks when the harvest is plenty. But to continue to give thanks in the midst of trial reveals the type of soil in which thanksgiving resides. The soil of humility will produce thanksgiving in all seasons--in sunshine and rain, in plenty or in want. The soil itself is something for which we must give thanks for it is not a soil we can produce on our own. It too is a gift of God's generous grace. So this Thanksgiving, and every day of the year, let us give thanks with a grateful heart, knowing that like the Samaritan leper, we are not worthy. And like the Samaritan leper, may we be filled with the same wonder and amazement that God would choose to extend his kindness toward us.